Open water is more than a movie - open water is everyday! A nightmare for every diver: Surfacing — and the boat is missing! One is surfacing — and alone, the boat is away! Or did currents sweep me away? "Godd luck" for all who became found after a long, nerve-racking drift. Better to book a boat with ENOS onboard! The daily routine on ENOS-Boats was never interrupted or changed because of missed divers! ENOS-Crews don’t search for missed divers. They precisely know where the divers are drifting and pick them up! ENOS combines GPS-Navigation and Radio Frequency. It is independent of external technologies. It is absolutely autonomous and does not require support from SAR (Search And Rescue) or Coast Guards. The crew of the dive boat can initiate the rescue operation immediately. Worldwide ENOS is the one and only rescue system for divers showing the crew precisely the positions of the lost divers on its screen. It functions absolutely independent and autonomously. It neither needs support of other rescue institutions (e.g. SAR) nor from external technologies (e.g. GMDSS, AIS etc.). The ENOS-Receiver is placed onboard and determines its position [A] through the GPS satellites. After surfacing the divers activate their ENOS-Beacons. Just a few seconds later the ENOS-Receiver receives the 1st Alert from the divers. A window appears on its screen showing the Beacon number and ID parallel to an audible high frequency alarm – now, the crew is immediately informed about the case of emergency. If the divers are still visible the crew can initiate the rescue operation now. Immediately after ENOS-Beacon has transmitted its 1st alert it determines its GPS position [B] through the GPS satellites. The 1st Alert and the GPS data are relayed on a radio frequency which is license free and does not require a radio certificate (SRC). The ENOS-Alert is free of charge and does not interfere in the GMDSS (Global Maritime Distress and Safety System). ENOS is the key for a speedy rescue! Now the crew just has to pick them up — just a few minutes after the divers surfaced and switched on their ENOS-Beacons. ENOS-Beacon ETX is a result of consequent engineering research. During development work our eyes were focused on divers’ needs. We demanded particularly high standards so that the Beacon stand the rough water sports business. ENOS-Beacon is 20 cm / 7.87 inches long, has a diameter of 3,5 cm / 1.38 inches and weighs 165 grams / 0.36 lbs only including batteries! It has no impact on the diver's buoyancy. Thanks to its pouch there are several ways to attach the ENOS-Beacon to the diving equipment. The ENOS-Beacon is very light — all the more it is very robust: No leaking problems! All antennas are inside the housing, maximum protected against damage — this worldwide unique! It's pressure proofed up to 330 feet / 100 meters, on request up to 660 feet / 200 meters. All 20 seconds ENOS-Beacon relays its signal. The crew gets permanent an update from the drifting diver. If the diver is located in a wave hollow while ENOS-Beacon is relaying, it’s rather unlikely that the alert reach the ENOS-Receiver because the water wave absorbs ("swallows") the radio wave. But 30 or 60 seconds later the diver is positioned on the top of the wave from where the ENOS-Signal can be easily received. At its top a far visible LED is placed which regularly blinks which increase safety enormously. The switch of ENOS-Beacon is very easy to handle: Just turn the red foot by 180° — that’s it. No confusing buttons which are difficult to handle with gloves (if at all …). Therefore ENOS-Beacon is easy to activate even with cold, icy fingers and even with thick dry-suit gloves. After switching on the asymmetric position shows clearly "ON" (Figure right) — important and calming in such stressful situation! Now, ENOS-Beacon just has to be hold above the surface (Photos above). This is important for an error-free transmission of the alert because the water wave "swallows"/absorbs the radio wave. The ENOS-Beacon relays its 1st Alert immediately to the ENOS-Receiver after activating. Depending on the height of the radio receiving antenna the receiving range of ENOS-System is up to 5.6 NM / 10 km. Why Batteries instead of Rechargeable Batteries? The ENOS-Beacon is powered by two AAA Lithium batteries, which are available all over the world. The change of batteries can be handled easily by the customer. No return to manufacturer, due to battery change! Imagine, a diver drifts in the open sea and the rechargeable batteries of his beacon don’t bring 100 % performance — although it was recharged all night long — horrible ...! This is the reason why we will never implement rechargeable batteries in our Seareq Rescue Beacons — because of your safety! ENOS-Beacons are powered by Lithium batteries with a guaranteed capacity of 18 years! The batteries provide full performance even after many years. No loss of power, no regular check of the batteries capacities. The current time of ENOS-Beacon takes 170 hours = 1 week! This is world record of all emergency beacons, set by our developing engineers. Thus the Beacon has always enough power, even after several rescue operations because an ENOS-Rescue takes just a few minutes in average. When the batteries have to be changed is clearly to see at the flash-lights of the LED and detailed described in the manual of ENOS-System. For all kind of boats the perfect ENOS-Receiver! Every diving center works different. Therefore we provide 6 different ENOS-Receiver, for every kind of boat: from inflatable vessels up to luxury liveaboards. During developing ENOS-Beacon we were focused on the drifting diver and his anxious feelings. During developing ENOS-Receiver our eyes were focused on the crew – for a smooth and speedy rescue operation. The ENOS-Receiver in a portable case with integrated Touch Screen. It is absolutely autarkic, with GPS and radio receiving antenna. The ERX-O must be used outside the cabin = Outdoor, because it can’t receive its GPS data inside a room. Receiver ERX-I (not pictured) is similar to ENOS-Receiver ERX-O. In addition to ERX-O the Receiver ERX-I provides a 2nd socket on its front-plate to connect an additional external GPS antenna. This enables an Indoor use of Receiver ERX-I. A portable ENOS-Receiver with a Tablet PC as mobile screen. The case receives the alert from the diver in need, evaluates the data and forwards them to the Tablet via Bluetooth technology. Just with a hand-held Tablet in hands it is much easier to watch for the divers. During transport the Tablet can be fixed on the front-plate. The ERX-BT-O is absolutely autonomous and completely equipped with GPS and radio receiving antenna. It must be used outside the cabin = Outdoor. Receiver ERX-I (not pictured) is similar to ENOS-Receiver ERX-O. But on its front-plate it provides an additional socket to connect an additional GPS antenna. Thus Receiver ERX-BT-I can be used also in a cabin = Indoor, because it will get its GPS position through the additional external GPS antenna. Always in command’s view: the permanent installed ENOS-Receiver with Touch Screen. The Receiving Station is fix installed onboard. It receives and evaluates the alert of the diver in need. These data are forwarded via Bluetooh to the Tablet PC which functions as mobile screen. All data at a glance: ENOS shows precisely the positions of the missed divers! The key for a speedy rescue! ENOS-Screen is easy to understand even under stress. It does not require navigation knowledge. The + in the center of the circle represents the position of the boat. The arrow on the top of the circle shows the boat’s heading. The numbers 1 and 2 within the circle are the precise positions of the drifting divers in relation to the boat. They are listed in order to the received alerts. The radius of the circle adjusts itself automatically according to the emergency call farthest away. Date, time, speed over ground and course over ground. Additionally the crew sees if the GPS data are valid and from how many satellites signals are received (each satellite one green bar; here: 8 satellites). The battery symbol in the right corner above shows the status of ENOS-Receiver’s rechargeable batteries (here: 97 %). Due to safety reasons every ENOS-Receiver receives all ENOS-Alerts within its receiving range — even from "strange" divers who belong to other ENOS-Boats! "External" alerts are shown with all necessary data for a speedy rescue, except their names (Alert No.2 on the white screen above). Thus all ENOS-Boats can help and give support to the rescue. 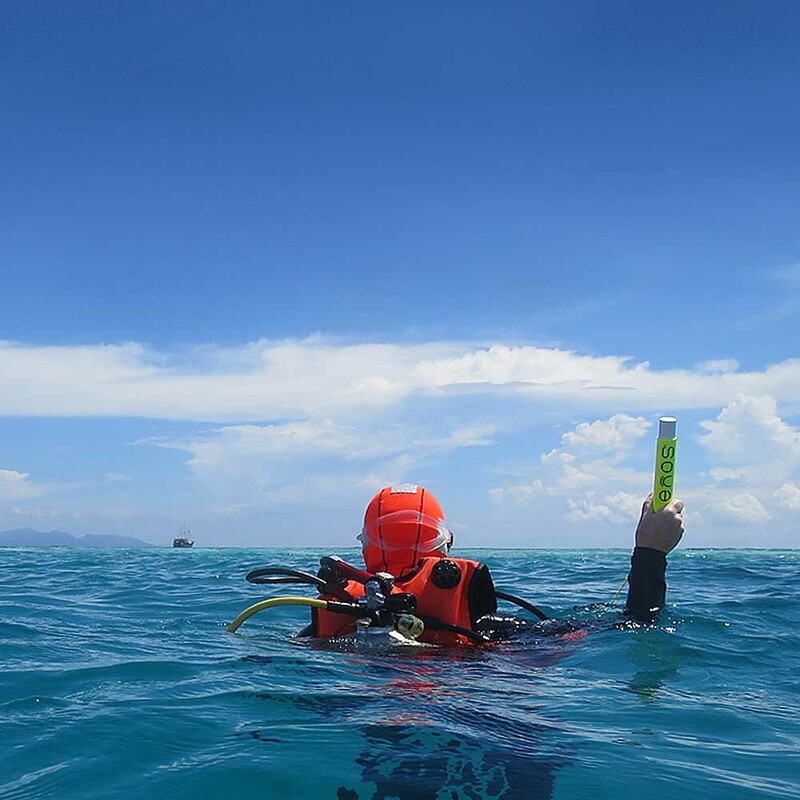 Worldwide, ENOS is the one and only rescue system for divers, which is able to receive, evaluate and to show multiple GPS alerts simultaneously on its screen. How far is the receiving range? How far ENOS-Beacon is transmitting? Depending on the circumstances the receiving range is up to 5.6 Nautical Miles / 10 Kilometers. As high the radio receiving antenna is mounted as huge is the receiving range. For an error-free transmission of the alert it is important to hold ENOS-Beacon above the surface because the water wave absorbs ("swallows") the radio wave. Therefore we have developed SIBO.1, world’s 1st Signal-Buoy holding an ENOS-Beacon high above the surface which supports the transmission of the alert enormously!